If two possible mechanisms can occur, there may be some factors that have an influence on the course of the reaction, tipping it one way or the other. One of the most important factors determining the mechanism of aliphatic nucleophilic substitution is the structure of the alkyl halide. The SN1 mechanism involves formation of a carbocation. Ion stability is often a very important factor influencing how easily a reaction occurs. It stands to reason that, the more stable the cation that forms, the more easily an SN1 mechanism can occur. There is a simple trend that more substituted carbocations are more stable than less-substituted ones. By more-substituted, we mean carbocations in which the carbon bearing the positive charge is attached to more carbons and fewer hydrogens. A tertiary carbocation is more stable than a secondary, a secondary is more stable than a primary carbocation, and a primary is more stable than a methyl cation. This trend is usually explained by hyperconjugation in the more substituted cation. In hyperconjugation, neighbouring σ-bonding orbitals overlap with the empty π-orbital that is the center of the carbocation. That electronic donation from the occupied σ-bonding orbitals helps delocalize the positive charge, lowering the positive charge on the central carbon and placing a little of it on the surrounding ones. Energetically, the interaction is favorable because the electrons in the σ-bonding orbitals are lowered stabilized by delocalization. Overall, SN1 reactions occur much more easily when the halide is attached to a more substituted carbon. The resulting carbocation forms more readily in what is otherwise the hardest step in the reaction. SN1 reactions occur most easily at tertiary carbons, moderately well at secondary ones, and very sluggishly at primary ones, if at all. Although they may be considered primary alkyl halides, compounds like benzyl chloride and allyl bromide are capable of undegoing SN1 reactions. Show why. SN2 reactions do not undergo highly charged intermediates, so ion stability is less important in that pathway. On the other hand, there is a stark contrast between SN1 reactions and SN2 reactions in terms of steric effects. SN1 reactions occur via a trigonal planar intermediate, which is less sterically crowded than the starting material. SN2 reactions do not occur via an intermediate, but the transition state through which they proceed is actually five-coordinate; the electrophilic carbon gets more crowded as the reaction proceeds. Steric effects are much more important in this concerted pathway. Comparing the approach to the transition state in a series of alkyl halides of different substitution, we can see some steric differences. 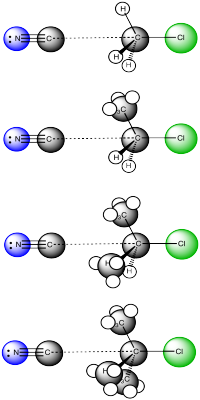 The pictures shows a snapshot very early in the reaction, when the nucleophile is just approaching the electrophile but the reaction is not really committed yet. Comparing these pictures, it seems most likely that the nucleophile will keep going forward in the top case, with the methyl. In the bottom case, with the tertiary halide, chances are that the nucleophile will just bounce off the methyl groups before it can connect with the electrophilic carbon. As a result, SN2 reactions are more likelyto occur with less substituted alkyl halides. They occur very easily with methyl halides and primary alkyl halides. They occur moderately well at secondary alkyl halides, but only with difficulty at tertiary alkyl halides. In each of the following cases, is nucleophilic substitution likely to proceed via an SN1 or an SN2 reaction?